The Chicago Police Department arrested 38 people during organized, data-driven gang and drug raids Thursday on Chicago's West Side. CHICAGO (WLS) -- The Chicago Police Department arrested 38 people during organized, data-driven gang and drug raids Thursday on Chicago's West Side. Police said they are searching for 18 more. 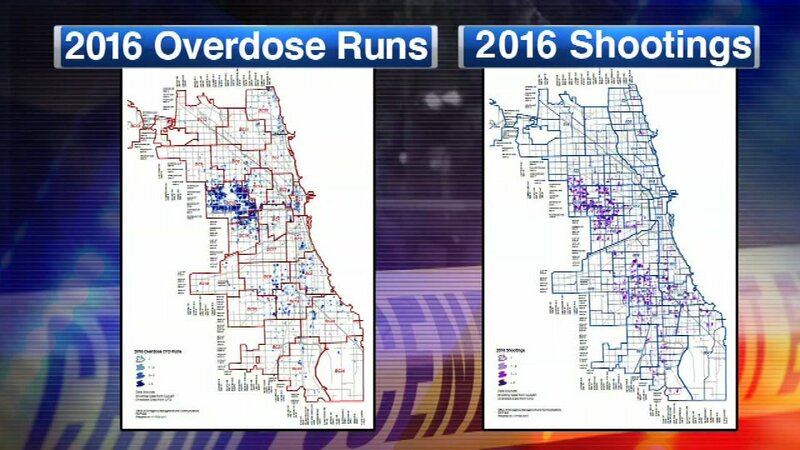 In planning the raids, police looked at a map showing calls last year for opioid overdoses. They compared that to a map showing where officers responded to shootings. The maps were almost identical, demonstrating that the drug trade is fueling violence in the city, police said. "Violence is the thing that puts these guys on our radar," said Deputy Chief Tony Riccio. "When they're using violence out there, when they're doing shootings, when they're doing killings to support this drug trade, it puts them on our radar and we continue to work to take them down and dismantle them." Police also said officers mistakenly entered the wrong apartment Thursday as part of the raid. They were looking for someone who lives in the same building, but a different apartment. He has been taken into custody.